This post has already been read 3891 times! 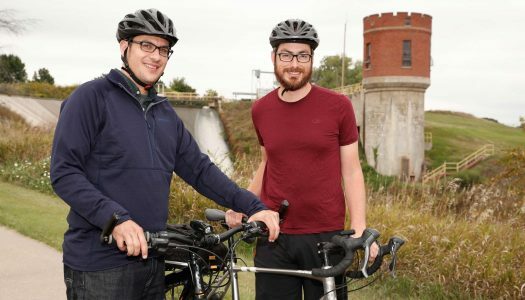 KEARNEY – David Vail and Will Stoutamire are avid cyclists. They’re also historians dedicated to preserving the past. 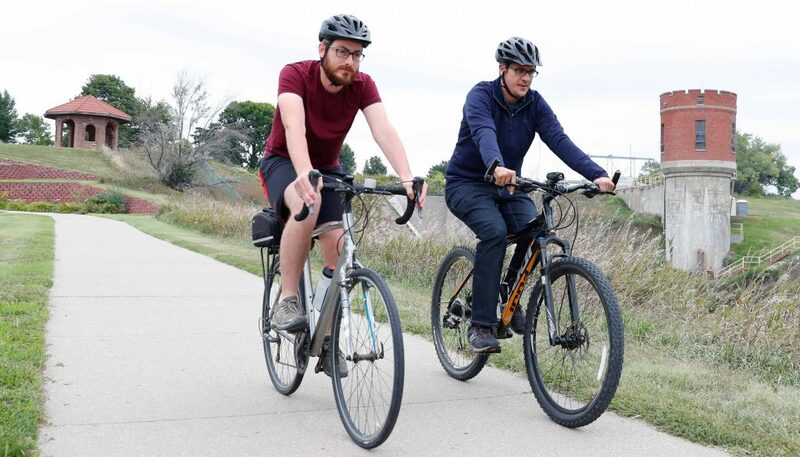 During regular rides along a local hike-bike trail, the University of Nebraska at Kearney colleagues often talk about their work and ongoing projects in this area. “Pedaling the Past,” a bicycle tour highlighting Kearney history, emerged from those conversations. “This idea kind of bubbled up as something that would combine two of our biggest interests and passions – history and biking,” Stoutamire said. The director of the G.W. Frank Museum of History and Culture, located on the UNK campus, is always looking for new ways to connect with the public and generate interest in local history. “It’s very typical for museums to sit back and allow visitors to come to them, but we want to be more active in reaching out to the community and engaging with them,” said Stoutamire, who is also a lecturer in UNK’s Department of History. Vail, an assistant history professor at UNK, shares the same philosophy. He grew up in Southern Oregon’s Rogue Valley and spent much of his youth exploring the state’s mountains and wilderness. “I’m constantly thinking about the landscape,” he said. During their Kearney rides, Vail and Stoutamire noticed a couple things. Many residents probably don’t realize how much of the community’s history they cruise past on a regular basis, he added. “Pedaling the Past” is a chance to change that. 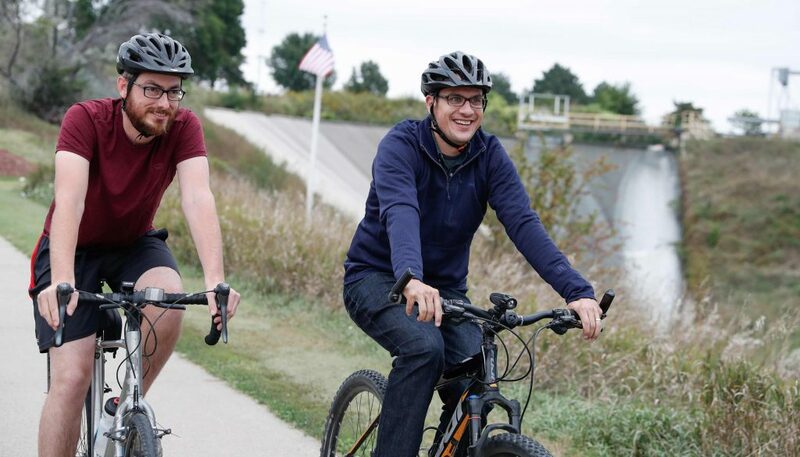 The outreach project, supported by Humanities Nebraska, the Nebraska Cultural Endowment and UNK Department of History, takes cyclists on a historical tour of Kearney landmarks along the hike-bike trail stretching from Yanney Park to Cottonmill Park. During the 8-mile round trip led by Stoutamire and Vail, eight stops will be made to discuss local history and field questions from participants. The roughly three-hour tour progresses mostly chronologically, from Union Pacific Railroad’s arrival in the 1860s to changes in the early 1900s. Points of interest along the route include the Kearney Canal and state’s oldest hydroelectric plant, the Kearney Cotton Mill, which closed in 1901, the Nebraska State Industrial School (now the Youth Rehabilitation and Treatment Center) and West Kearney, a large development that began in the early 1890s and is now a cornfield. “Pedaling the Past” tours are free, with a limit of 30 cyclists per session. They’re open to anyone interested in biking and local history, and each participant receives a souvenir T-shirt. Tour dates are 9 a.m. to noon Sept. 22, 1 to 4 p.m. Sept. 30 and 9 a.m. to noon Oct. 13. Registration is available online at unk.edu/pedalingthepast. Vail and Stoutamire hope to expand the project in the future. They see the potential for more UNK faculty members and students to get involved, as well as community partners such as the Buffalo County Historical Society. They’d like to eventually cover new paths that highlight other aspects of early Kearney and install permanent signage that allows cyclists to explore the city’s history on their own. “We have a lot of ideas for growth and expansion,” Stoutamire said. But that’s a little farther down the road. For now, they’re taking it one ride at a time. This is really great!!! Kudos to Dave and Will for doing this. What an imaginative, rewarding project!